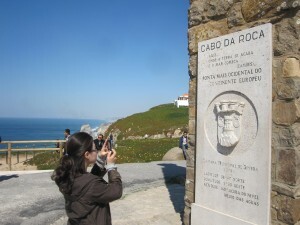 There is nothing particularly unusual about Cabo Da Roca, no specific feature that sets it apart from the other 800+ kilometers of stunningly beautiful, cliffs-crashing-into-the-ocean Portugese coastline. But from a geographic perspective, the cliffs of Cabo Da Roca are significant: they mark the westernmost point of continental Europe. When I was there last month, I didn’t find the “rugged, windswept remoteness” that the Lonely Planet promised. In fact, I couldn’t even get a picture to fake the windswept remoteness. I tried. But there were so many tourists in my shot that I quickly gave up, and instead amused myself by taking pictures of people taking pictures. What is it that draws us to geographic extremes, places that are unexceptional from the ground but hold some sort of cartographic significance? The blockbusters are easiest to understand, as they’re some of the most awe-inspiring points on the planet: there’s the highest point on earth (Mt. Everest) and the lowest (Dead Sea), the longest river (Nile) and the biggest (Amazon), the driest dessert (Atacama) and the largest one (Sahara), not counting Antarctica. These places are, justifiably, at the top of many “must-see” lists. But then there are the B-listers, places you’ve never heard of unless you happen to be traveling nearby. Like Cabo Da Roca. Or the nearby Cabo de Sao Vincent, several hundred kilometers away, which marks the southwestern tip of continental Europe. Every continent and every country has a directional extreme, and within it, every region has a highest mountain or a largest lake or a highest waterfall. Maybe I’m just a geography nerd, but I still think there’s something cool about visiting the B-listers. Like Kanyakumari, which marks the southern tip of India. Sure, there’s not much to do there, it’s hard to get to, and it’s not as beautiful as other coastal points in the area. But it’s precisely at these geographic extremes that you are forced to imagine your place in the world at that very moment—and it’s hard not to be blown away by the enormity of the planet and your tiny, speck-like existence upon it.